Unlike most production boatbuilders in Asia, Shanghai Far East Boats is a legitimately indigenous company manufacturing its own line of boats, as opposed to a Western-based enterprise looking to lower its labor costs. Unlike most production boatbuilders in Asia, Shanghai Far East Boats is a legitimately indigenous company manufacturing its own line of boats, as opposed to a Western-based enterprise looking to lower its labor costs. Far East got its start building Optimists for the Asian championship regatta held in Qingdao, China, in 2002 and afterward became particularly adept at laminating high-quality foils. More recently, it has begun building larger boats as well. Among these is the Fareast 18, which came out on top in the trailer-sailer category in SAIL’s 2014 Best Boats awards. 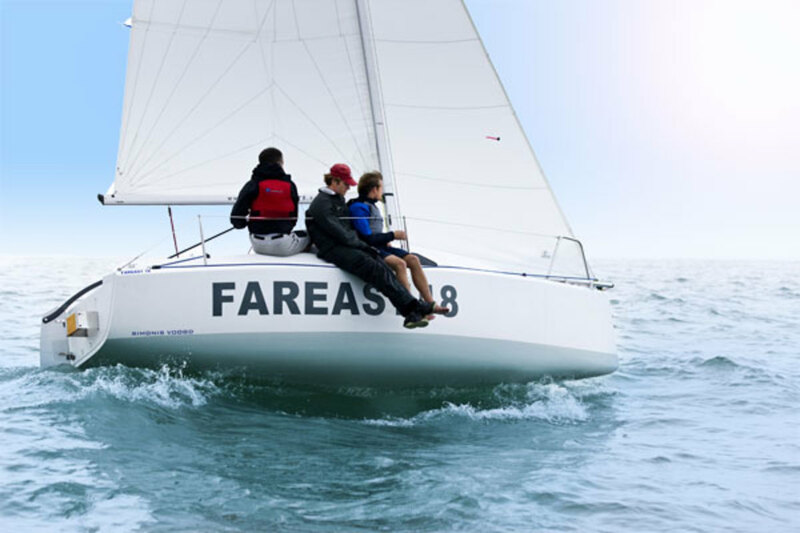 A smaller version of a 26-foot sport boat the company also introduced to the U.S. market in 2013, the Fareast 18 is available in either a standard or performance “R” version for use in everything from sail-training to one-design racing to stress-free daysailing with the kids—all areas in which it excels. The resin-infused hulls are constructed with multi-directional fiberglass fabric and have PVC foam cores. A lifting keel and removable transom-hung rudder make the boat easy to trailer. External chainplates secure the shrouds supporting the boat’s single-spreader Seldén rig. The canoe body and underwater appendages are identical on both versions of the boat, and include a plumb bow and truncated stern; however, the standard version features a slightly larger cabintrunk to provide some additional space belowdecks, and cockpit coamings for more security aft. The backstay-less rigs are identical, and both boats are available with a retractable sprit for flying an A-sail. A hint of reverse sheer combined with high topsides maximizes interior space in both models. I test-sailed an 18R with designer Maarten Voogd, of the Dutch design firm Simonis Voogd, and was pleased to see how well the boat did despite the light conditions. Sailing upwind at around a 40-degree apparent wind angle, we still slipped along at just under 5 knots in wind that topped out at 8. Cracking off and hoisting our reacher, we accelerated to just under 6 knots in a few oh-so-tantalizing puffs. According to Voogd, this kind of light-air performance is no accident, but reflects the conditions that are common in the Asian waters where the boat was born and is actively raced. For an 18-footer, the boat felt surprisingly large. It was also encouragingly stable, thanks to the 617lb of righting force providing by the fin and ballast bulb below: something that will provide great assurance to any newbies who step aboard. The boom is good and high, making it easy to get from one side of the boat to the other when tacking—another nice feature, whether you’re racing or teaching. Then there’s the helm: not only is the carbon tiller a gracefully curved work of art, the rudder is gorgeously constructed and immensely powerful, providing precision control and an intimate feel for how the boat is passing through the water. For those not lucky enough to steer, both the 18 and 18R feature stainless lifelines and a nicely beveled hull-deck joint that should take some of the discomfort out of rail-meat duty. All in all, this is a sweet little boat from the other side of the world that will hopefully find a home in the North American market as well.